Whether you need breakfast, brunch or lunch, this tasty, quick to prepare, tofu scramble has got you covered! It is an especially great option when you want something jam-packed with protein. One serving and you have 40% of your RDI locked down. BOOM. 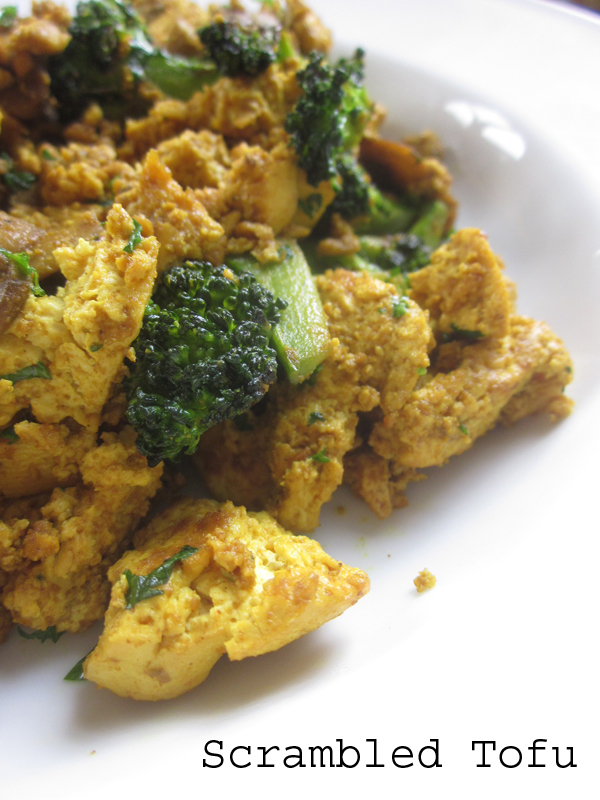 Scrambled tofu is a vegan staple that has been conspicuously absent from my life until recently, when I started experimenting with my own version. After a couple of dodgy attempts, this one emerged a winner. It is a fast, flavourful ‘fu that will give you plenty of energy to burn. Better yet, once you have the tofu pressed and veges chopped, things come together very, very quickly so you will be eating before you know it. Make sure you don’t crumble the tofu too much – you want some nice, chunky pieces in there. You can do without adding nutritional yeast if you don’t have any lying around, but if you do, it really adds a subtle little x-factor to the scramble. Add peanut oil to a medium hot frying pan and heat for 15 seconds. Add broccoli and cook, stirring regularly, for 2 minutes. Add mushrooms, along with a splash of soy sauce, and cook for 1 minute. Using your hands, break tofu into pieces, directly into the frying pan. Add sesame oil, miso, water, cumin, turmeric, soy sauce and nutritional yeast. Mix thoroughly, until seasoning is evenly distributed, making sure not to crumble the tofu much more. Reduce heat to medium-low and cook for 4-5 minutes, stirring occasionally, until some of the tofu begins to brown. Chop herbs finely and sprinkle over tofu mixture. Mix gently until combined. Season with a little salt and fresh black pepper, if desired. Serve immediately.